President Donald Trump is withdrawing the U.S. from the 2015 Iranian nuclear agreement, he announced Tuesday. 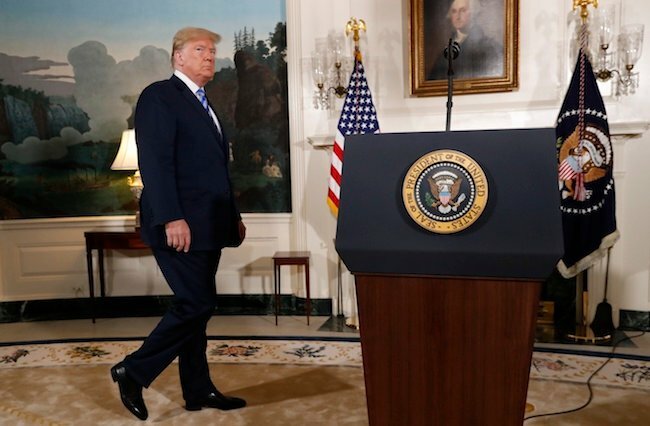 Trump signed a memorandum to reimpose devastating economic sanctions on Iran in a bid to force the regime back to the negotiating table for a new agreement. The president has long railed against the 2015 nuclear agreement noting its lack of perpetual ban on a nuclear program and how it fails to address the Islamic Republic’s malign activity across the middle east. The new deal the president will seek would not have a similar “sunset clause” which ceases restrictions on Iran’s nuclear program and would also address the regime’s ballistic missile program. Iran has continued to test and deploy ballistic missiles capable of carrying nuclear warheads, despite signing the deal. Iranian foreign minister Javad Zarif however has indicated his government may not be willing to negotiate any follow on agreement with the U.S. if Trump withdraws. “If Trump makes this mistake and scraps the JCPOA (Iran’s nuclear deal) as an international achievement, he will later have to accept the rights of the Iranians under a worse situation,” he said Tuesday. The decision was not well received by European signatories to the deal who mounted a last ditch effort to convince the President not to withdraw. Two European heads of state and the British Foreign Secretary visited Washington in the span of two weeks to instead convince Trump to keep the agreement and attempt to negotiate a follow on agreement.